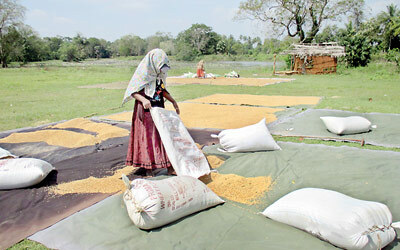 Farmers expressed fears this week of a further drop in paddy prices as the harvest season reaches its peak. Harvesting in the main cultivating areas such as Polonnaruwa, Ampara and Kurunegala are expected to be completed in the next two weeks and farmers say their paddy is having to be sold to private millers for a record low of Rs. 14-20 because the Paddy Marketing Board (PMB) is delaying purchases at a higher, fixed rate. rvest in their stores so they can’t buy the new harvest in time. Our farmers are left with the new harvest and they need to dispose of it,” All-Island Farmers Federation (AIFF) Secretary T.B Sarath said. He said most of the paddy was being sold cheap to private millers. He said farmers are planning to file a case against the PMB. The head of the Parabowa Farmers Association (Puttalam), M.A. Rasika Premasiri, also castigated the PMB. “It is only now preparing to buy our paddy. The desperate and the poor farmers need to pay back loans and are forced to sell to private dealers who come for their stocks,” he said. Mr. Premasiri said that government had not even started to collect paddy from Puttalam farmers. He claimed that that the government said it would pay high prices for paddy grown using organic fertiliser “but such thing is not happening”. The president of Anuradhapura Mahakandura Farmers Association, Susantha Kumara Nawaratna said the government had not purchased paddy from that area. Mr. Nawaratna said farmers spent around Rs. 45 to grow a kilo of samba paddy and yet the government was buying it only for Rs. 41. 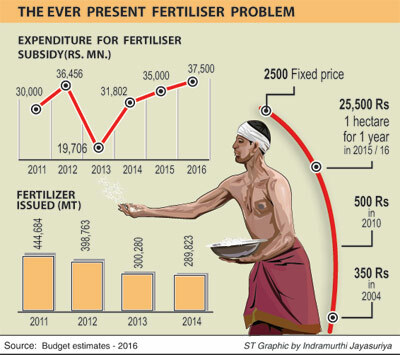 The government was buying nadu paddy for Rs. 38 and keeri samba for Rs. 50 but it cost the farmer Rs. 45 to grow those. He said farmers wanted a market price of more than Rs. 50 for a kilo of paddy. PBM Chairman M.B. Dissanayake said the government had started buying paddy from eight districts, including Polonnaruwa, Ampara, Jaffna, Mullaitivu, Kilinochchi, Vavuniya ,Mannar and Matale. He admitted the PMB had not yet been able to clear all the previous harvest from its stores and there was about 126,000 metric tonnes (Mt) remaining. Privately-owned sites will be hired to store the new harvest, Mr. Dissanayake said. “Our plan is to buy 160,000 Mt of paddy from the farmers while each farmer can provide paddy up to 2,000 Mt”, he said.